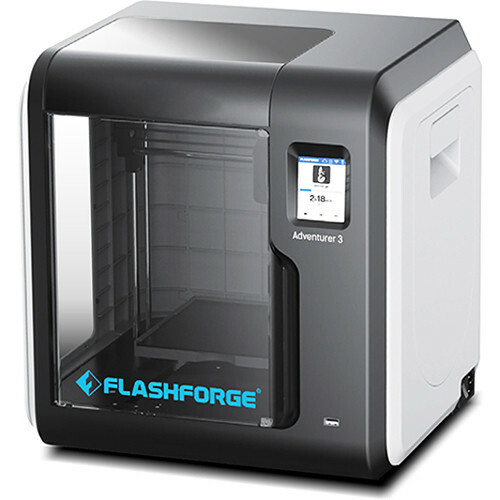 Build Volume: 5.9 x 5.9 x 5.9"
Print your 3D models with the compact FlashForge Adventurer 3 3D Printer. With a build volume of 5.9 x 5.9 x 5.9", the Adventurer 3 prints your 3D models in an enclosed print area with a removable heated print bed. The single extruder is detachable, utilizes stainless steel tube material, and can heat up to 392°F in approximately 50 seconds. The buckle design of the nozzle supports quick replacement for easy maintenance. The Adventurer 3 supports a variety of filament types, such as ABS, PLA, Pearl, PLA Color Change, metafilled, wood-filled, and high-speed PLA. It also has a built-in automatic filament feeder with an enclosed built-in filament cartridge. Print via USB, Ethernet, or Wi-Fi. You can also print via 3D Cloud, an online platform that has many features, such as cloud management, uploading and storage for 3D print files, and a free model database. There are even social media functions, such as leaving likes and comments. You can navigate the menu with the integrated full-color touchscreen and monitor your current 3D print job with the built-in HD camera. Box Dimensions (LxWxH) 21.0 x 18.0 x 17.0"
Adventurer 3 3D Printer is rated 5.0 out of 5 by 1. Rated 5 out of 5 by Catherine from Great! But needed some work. I bought this thinking it was a printer that was easier to work with. Thankfully I have owned a 3D printer before which helped me out. The issue I had is that the calibration was way off. When I took a day of frustration to fix the machine. (Make sure to have the extruder smashing down the filament really hard, with the heated plate.) After I fixed the issue it works great. Extremely high quality prints with a nice touchscreen interface.